Brownsville police respond to a body of an unidentified person found in the Fort Brown Resaca near Texas Southmost College and the University of Texas Rio Grande Valley. 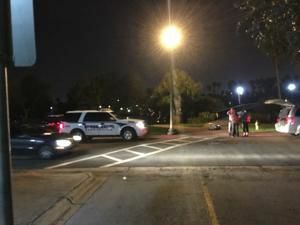 A body of an unidentified person has been recovered from the Fort Brown Resaca near Texas Southmost College and the University of Texas Rio Grande Valley, the Brownsville Police Department said. Law enforcement officials from the Brownsville Police Department and UTRGV responded to Gorgas Drive for a report of a body recovered from the Fort Brown Resaca on Monday evening. The Brownsville Herald attempted to contact Brownsville Police Department Spokesperson J.J. Trevino for more information, but was unsuccessful. Texas Southmost College officials said there is no comment regarding the incident Monday night. A campuswide email from the TSC Emergency Operations Team was sent out stating an incident had occurred near the college, but posed no threat to the community.